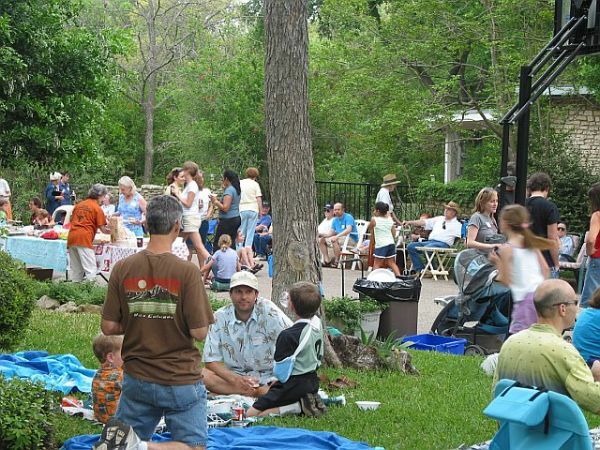 Sunday Afternoon April 2, 2006 was the date for the 15th neighborhood party on 49th Street adjacent to the Shoal Creek Dam. The party is a place to socialize with many of the people you meet while walking. You learn their names [they become Chris, not “the slow Shelty”] and where they live. There’s food, drinks, music, games. A contact list is distributed so you can remember those names and find that person you were talking to about compost. Kids get to know each other, not just adults. This was the 15th year, with the largest attendance, 150 or more. Music was by DJ Jahkarma. An informal committee of folks who live close to the Strass –49th St intersection organizes things. This year Jackie and David Stence [ the party’s held in the street next to their house and all over their lawn] , Kelly and Sam Terry, Amy Wood and Todd Shaw, Monica and Geoff Mueller, Becky and Steve Reedy were the committee. Geoff Mueller and Joe Reynolds were the Burger Chefs. A small donation is solicited in the flyer announcing the date, to cover the burgers / dogs / BocaBurgers / drinks and paper goods. The rest of the spread is ‘Bring to Share’ and the sharing is spectacular. Attendance is from many of the streets in the south of Allandale; mostly Strass, 49th, 491/2th, Pembrook, Rue, Finley, Fiset, but also Chiappero, Oakmont, Shoalwood, Fresco, and Turnabout. 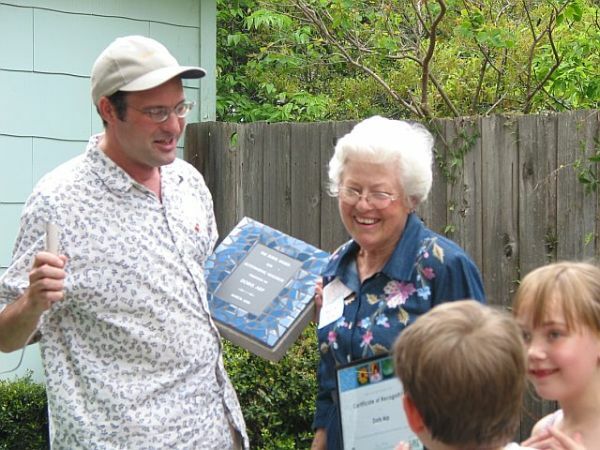 This year Doris Arp was given a Plaque as the first recipient of a new annual award for neighborhood service named in her honor. Doris is one of the remaining ‘original owners’ who have lived in their houses since they were built in the 1950s. During her walks she collects litter and dispenses cheer. photographs.] After Dale moved several neighbors decided to keep the party tradition and several more were held in August. The summer heat and conflict with vacations got the date moved to the Spring. Click here to view more photos of the party.